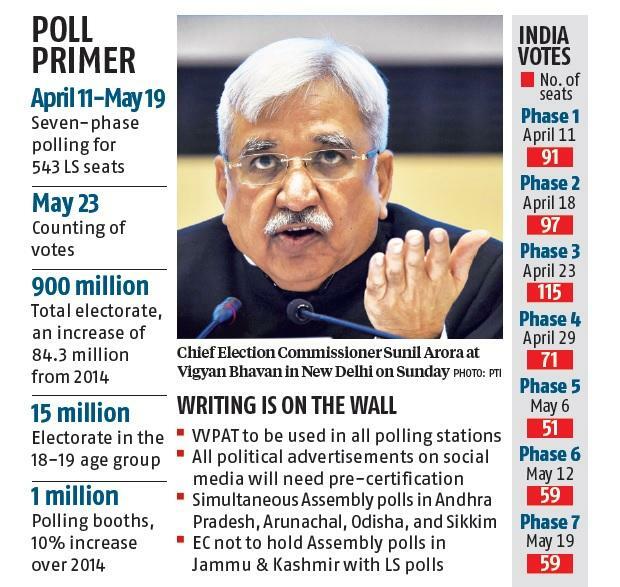 Voting to elect the 17th Lok Sabha (LS) will be held over seven phases from April 11 to May 19 and the counting of votes will take place on May 23, the Election Commission (EC) said on Sunday. Apart from polling for 543 LS seats, the states of Andhra Pradesh, Arunachal Pradesh, Odisha, and Sikkim will have simultaneous Assembly polls. 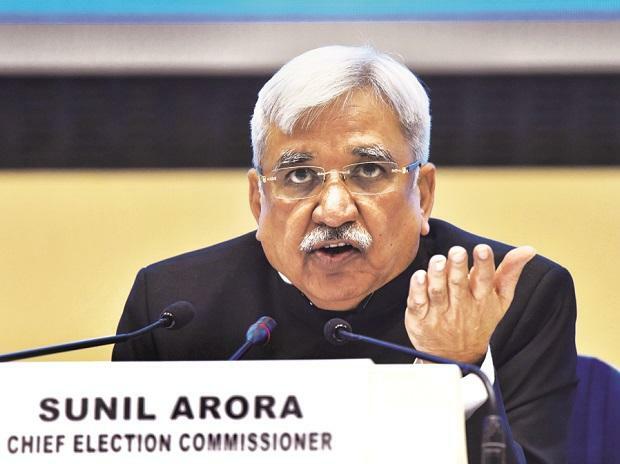 Chief Election Commissioner Sunil Arora said security challenges had made the EC decide against holding Assembly polls in Jammu & Kashmir along with the LS polls. The EC has appointed three former bureaucrats as special observers to monitor the security situation in the state. With the announcement of the poll schedule, the model code of conduct also came into force with immediate effect. The model code of conduct is applicable to all political parties, all states and Union Territories, the EC said. It bars governments from announcing any policy decisions that can influence the electorate. In other changes for the LS polls, the EC has asked candidates to give details also of all their offshore assets in the affidavits to be filed with the poll panel. Candidates will also need to provide income-tax returns of the last five years, not only of self but of their spouses as well. Candidates who are kartas or coparceners in a Hindu Undivided Family will need to disclose these details to the EC. Arora said a total electorate of nearly 900 million, an increase of 84.3 million from 2014, will be able to exercise their franchise. He said there are 15 million in the 18-19 age group. The LS polls will have 1.03 million polling booths, an increase of 10 per cent since the last LS polls. VVPATs, or voter verifiable paper audit trails, will be used in all polling stations this time. As many as 1.74 million VVPATs will be used. All political advertisements on social media will need pre-certification. The EC, along with social media platforms, will keep a close watch on the use of hate speech. Social media platforms have appointed grievance redressal officers, Arora said. Political parties welcome the announcement of the poll schedule. “The last five years have shown that with the blessings and participation of 1.3 billion Indians, what was earlier deemed impossible has now become possible,” Prime Minister Narendra Modi tweeted. Some political parties questioned parts of the poll schedule, particularly to do with the EC deciding to hold polling in Maharashtra across four phases and in Bihar and West Bengal across seven phases. 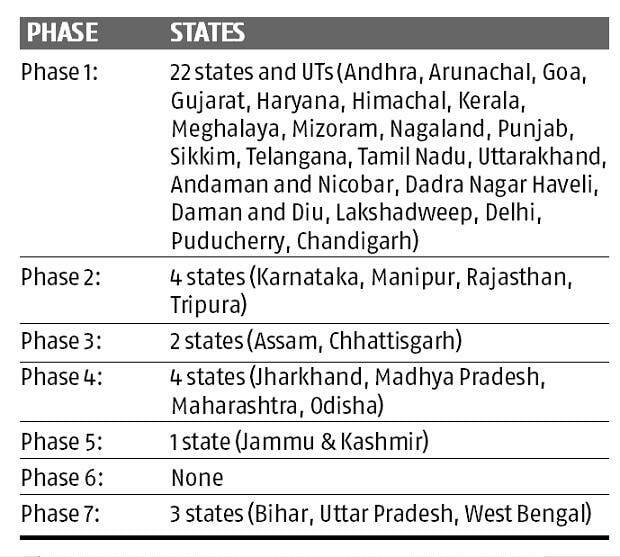 In 2014, the polling in these states was concluded in half or lesser number of phases. Opposition parties said the deferring of the Assembly polls in Jammu & Kashmir was because the Modi government “mishandled” the situation. “PM Modi has surrendered to Pakistan, to the militants, and to the Hurriyat. Well done, Modi Sahib. 56-inch chest failed. Slow clap,” National Conference vice-president Omar Abdullah tweeted. “The Centre’s tall claims regarding the situation in the state stand exposed. The Centre has itself certified that the situation is out of control and not conducive for holding simultaneous polls,” Congress state unit president G A Mir said. Punjab Chief Minister Amarinder Singh welcomed the EC’s move to call upon all parties to advise their candidates and leaders to desist from displaying photographs of defence personnel in advertisements. In the 2019 LS polls, Modi-led Bharatiya Janata Party (BJP), along with its allies, is seeking re-election on the back of the government’s performance, while the Congress is busy building alliances across the country to defeat the BJP-led National Democratic Alliance. The BJP has also struck several alliances in key states. Modi and BJP chief Amit Shah have campaigned across the country in the last couple of months and showcased the government’s achievements in meeting national security concerns and launching schemes for the poor. The Opposition, enthused after the BJP’s defeat in three north Indian states in December, is hopeful of defeating it in the LS polls. It has focused on the Modi government’s “failures” in managing agrarian distress, joblessness, demonetisation, and the goods and services tax.